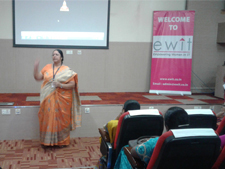 eWIT organized a Role Model Series Lecture hosted by Sutherland Global in their auditorium at Velachery. The Role Model of the evening was Ms. Nasreen Fathima Dawood, Associate Director Leading IT Service Delivery in IBM. Ms. Nasreen gave a speech from her heart, talking about how she scaled up in a less glamorous domain of Remote infrastructure services, being from a conservative society that gave importance to marriage and families for women then career and what made her strike a balance. She mentioned that career is a like a child and it is not a marathon to finish the task and achieve it in a day. She also added one need to work hard to achieve something in their career. She felt a good support system is required for a balanced career. She stated that real experience is the foundation for a career. She said the secret of success is spotting the opportunity and never saying no to it. She highlighted that it is important to dusting your hands at the early stages of career and learning things hands-on is important for a strong career foundation. She also emphasized on the purpose with which we need to move forward and also on how to make women independent and self-reliant. She also said personal beliefs needs action and it is important to give it back to the society and help in promoting women cause. She briefed how NLP helped her shaping up her personally and officially. She answered questions posed by the participants enthusiastically. 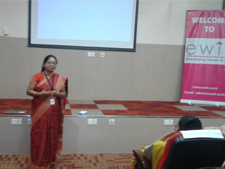 Ms. Lakshmi Gopal presented a memento to Ms. Nasreen with thanks from eWIT.